What next for Luke Shaw? You can barely go ten minutes without seeing Alex Sandro being linked with United, despite the fact no real noises have been made, with Ashley Young still on holiday after his World Cup exploits, and Matteo Darmian imminently leaving the club, the baton is passed to Luke Shaw. Despite the support of a lot of United fans, Shaw has never quite delivered in a red shirt, and the 18/19 season will be his fifth at the club. By now, many expected him to be far and away the best left-back in the country, with individual honours and international caps to show for it. It’s well documented that the leg break suffered at the beginning of 2015/16 is something which has held Shaw back, as well as his apparent fractious relationship with current manager Jose Mourinho. However, he’s had three games this pre-season, and he hasn’t looked as though he could be a first-choice option in any of them. United are struggling on the transfer front, with the aforementioned Sandro settled at Juventus with the Italian champions seemingly reluctant to sell the Brazilian international. There doesn’t seem to be any other realistic option either, so it seems as though Young and Shaw will continue to battle it out. He’s never played more than 16 league games in a season at the club – that’s less than half a season – and in the last two campaigns, has featured only 11 times a piece. Last season he didn’t even feature in the league until December (in a 1-0 home win over Bournemouth) and then was in and out of the team but for a four game spell in the winter period. That four game spell is more significant than sheer stats would suggest. United faced Burnley, Southampton, Everton and Stoke, the ever reliable Ashley Young shifted over to right-back and Shaw took his chance. It was during this spell were Jose quipped: ”There is no better left-back in the country than Luke Shaw”. However, the so-called best left-back in the league only made two more starts in the Premier League from that game versus Stoke, until the end of the season, leading some to suggest that Luke Shaw simply could not impress the manager. However, the suggested feud between the two dated way back to when Luke Shaw was a Southampton player and had just boarded the plane to the World Cup as an eighteen year old in 2014. Shaw, reportedly a boyhood Chelsea fan, was a target of Mourinho’s when he was in charge of the Stamford Bridge club, but claimed Shaw’s absurd wage demands prompted him to look elsewhere. “We would have killed our stability with financial fair play and killed the stability in our dressing room”, said Jose in 2014. He publicly criticised him at the beginning of 2016/17 as well, after a poor performance in a 3-1 defeat at the hands of Watford. ”Today for the second goal, (Nordin) Amrabat on the right side, our left back is 25 metres distance from him, instead of five metres. But even at 25 metres, then you have to jump and go press. But no, we wait”, were Mourinho’s comments after Juan Camilo Zuniga’s goal consigned United to defeat on that September afternoon. That wasn’t even the last of it. He made only four more starts that season as Mourinho questioned the commitment of the seven-time-capped England international. “I cannot compare the way he trains and commits, the focus, the ambition. He is a long way behind”, when compared to Ashley Young, Matteo Darmian and the now-departed Daley Blind. Scathing criticism when you consider that Blind and Darmian made only 15 league appearances between them in 2017/18. That question of commitment needs quashing by time Leicester visit Old Trafford on August 10. Jose is a fan of reliability and solidity, something epitomised by the likes of Ashley Young and Paulo Ferreira, full-backs who aren’t spectacular but do the job, especially in defence. The 23 year-old has his contract up at the end of the forthcoming season, and there haven’t been many noises for Shaw’s initial contract to be extended beyond the five years he signed for upon his arrival from the south coast. £27m for five mediocre years isn’t the outlay United would have hoped for when Shaw became the world’s most expensive defender. What are the options for the London born left-back? It doesn’t look likely the club would be able to recoup even half of what they paid for him. There’s no real concrete interest in him. He could certainly do a job in the Premier League if he was to leave Old Trafford. English players going abroad is a theme of recent years, former number one goalkeeper Joe Hart is one of the most high profile cases of recent times when he spent a season in Italy, turning out for Torino, youngsters such as Chris Willock, Jadon Sancho and Keanan Bennetts have recently left the country to pursue careers elsewhere. That could be one such possibility for Luke Shaw. A positional change is also a distinct possibility, providing Shaw to add the versatility arrow to his bow, something which has increased the game time of Ashley Young and Antonio Valencia in recent years after their switch to full-back. With a possibility of a three-at-the-back formation being deployed from time-to-time, Shaw could fill the role which Marcos Alonso occupies at Chelsea, such as he did on two occasions last season against CSKA Moscow and West Ham United. 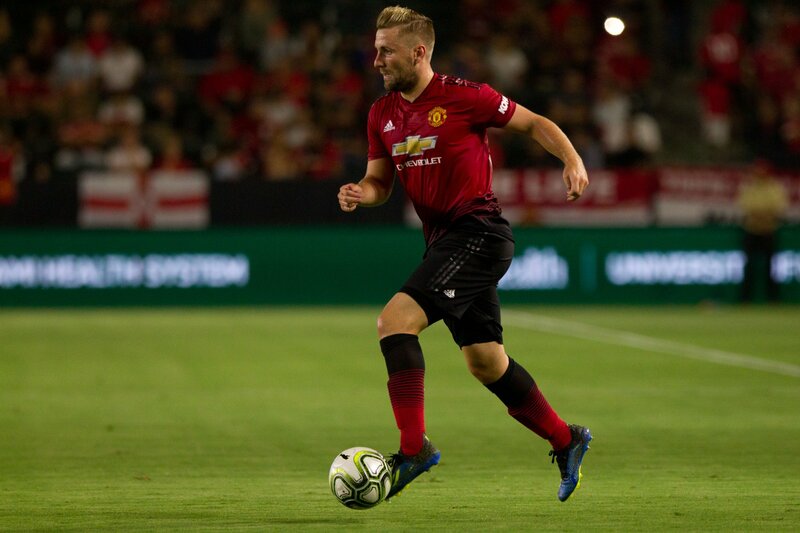 Jose has said that Shaw will start the season due to the lack of options in the role, so he has further chances to stake a claim and to gain the manager’s trust. If he wants to add to his seven England caps – six of which came three years ago – then that’s exactly what he’ll have to do if he’s to stay at the squad. Yes, pre-season has been underwhelming for him on a personal level. But he has a saving grace, one more chance to show he can be the long-term solution we all hoped he would be.